Many indoor drills can be adapted from what is normally considered an outside activity. 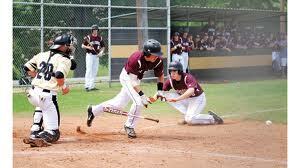 Squeeze Bunt Drill: Depending on the accommodations there are several methods of performing this drill. 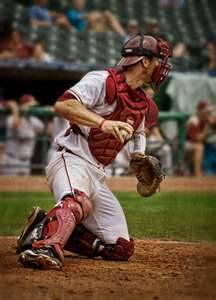 You will need a catcher, in full equipment, a batter and a coach to pitch. Again, this drill can be used to train the entire infield at the same time for their responsibility in a bunt situation. If you have a canvas back stop, a mat used for gymnastics or any other similar material you can hang or use as a back stop, perform this drill with a baseball. If this is not feasible use a tennis ball. Since a gym floor and a dirt infield are nothing alike, you can’t expect your players to learn how to lay and guide a perfect bunt down. However, you can practice suicide bunts. The primary goal in this drill is to have the hitter bunt the ball no matter where it’s pitched in order to protect the runner who is running in from third base. Using a baseball will add the element of how the bat should feel when contact is made while attempting to deaden the ball. Using a tennis ball will suffice in teaching the hitter to make contact with the ball. Position your infielders in their respective places, they don’t have to be at 90’ intervals, just spaced as far as reasonably possible. When the coach pitches the ball the hitter must make contact with the ball. A fair bunt is the intent allowing the run to score, but contact preventing the runner from being tagged out is the primary objective. 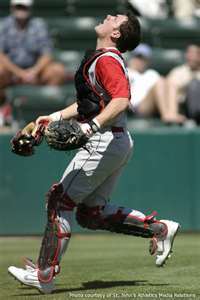 When the batter squares around to bunt, the infielders should go through the motions of completing their obligations. In other words, the two corners come in, second base man covers first base and the shortstop moves to cover second base. It’s up to the coach at what speed he wants these players to move. To review: The coach throws difficult to bunt pitches, the hitter concentrates on making contact and the infielders automatically go to their assigned responsibility base to cover or charge the ball. When a ball is popped up foul behind home plate the normal regiment is to quickly remove your mask, locate the baseball, discard your mask your mask then catch the ball. I realize you probably already know this, however, repetition, repetition. What you may not know is your first reaction before any of the above is to quickly stand and turn your back to the infield, but you don’t want to be craning your head around, which throws your body off balance, while searching for the ball. "Remember...the Fly Ball will Fade back towards the Infield as it drops"
Secondly, should the ball appear to be hit straight up or perhaps a little behind the plate, do not move forward to catch it. A foul ball hit high and more or less straight up will have a tendency to float back towards the infield as it descends. Always try to catch the ball above your head as it offers your best line of vision and …let’s face it, there’s little room for error when using a catchers mitt. The sooner you secure the ball, the better. Remember, you don’t want to go forward seemingly following the ball, only to have the ball fade backwards and land behind you because you can’t back up quick enough to reach it. One last tip for this segment. When working in the bullpen, take it seriously. Use this time to develop your skills. Give pitchers good targets, move your body to the ball, do everything as if every pitch was in a game situation. You will improve your skills and the pitchers will fight over having you catch them as your professionalism also improves their concentration level. When both of you are focused, nothing but good can come out of the situation. When throwing to second base it is important to have proper throwing form to insure an accurate throw. This drill will help develop it. 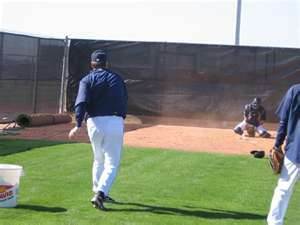 1.The Catcher will position himself on the right side of the pitchers mound. 2. From his knees he will throw to second base, using his arm only. This isolation of the upper body forces the player to face the target and make short throwing movements in which the throwing hand passes close to the ear.